Welcome to my blog! My husband (Mr. H) and I moved into a Victorian bungalow this previous fall and since then I've been busy turning it into a home we'll never want to leave. I love home decor, antiquing, DIY projects and international travel and wanted to share my loves with all of you. For my first post I thought I'd share a project that showcased some of my current obsessions...lavender, wine crates, France, and colored glass bottles. Mr. H helped feed my obsessions by making this box to hold my lavender in the bathroom. He went to a wine shop and asked if they had any wooden wine crates for sale and came home with this one! He cut the sides down and created a box that was just the right size. The fact that the wine crate is from a French wine makes it all the more perfect. 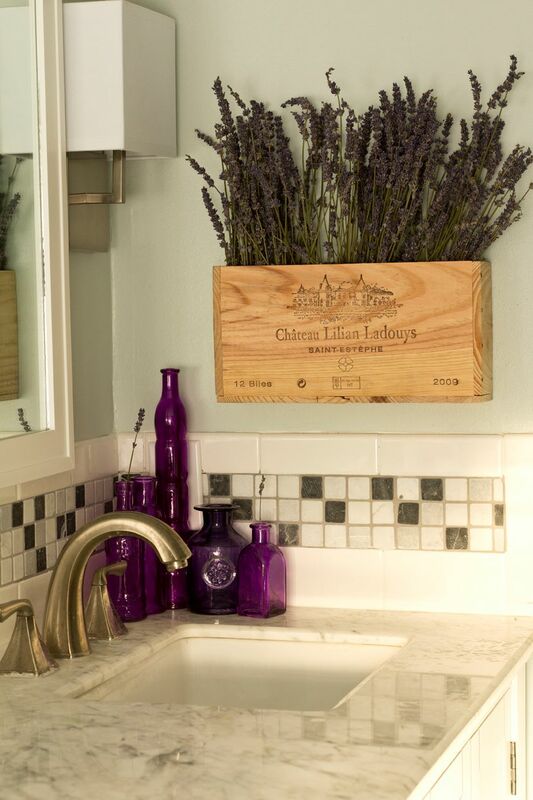 What a great way to display lavender. I may have to copy this. Now, if I can just find a great French wine crate. My husband got it for me at a store that specializes in French wines so maybe if you have something similar, try there! Thanks so much for stopping by! Gorgeous! I love those colors--both are so soothing!